These two albums, recorded three years apart, provide at least a cursory glance at the continuing development of San Francisco’s aptly named Contemporary Jazz Orchestra. 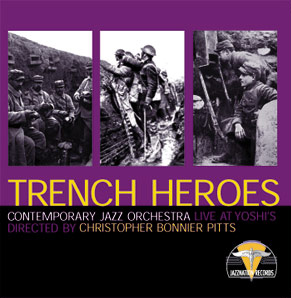 Trench Heroes was taped in ’98 during a “road gig” at Yoshi’s nightclub across the Bay bridge in Oakland, CA, Monday in the City last December on the orchestra’s “home field,” Jazz at Pearl’s, in San Francisco’s popular North Beach district. The CJO had changed directors in the interim, with Alex Budman replacing charter member Christopher Bonnier Pitts, while among the rank and file, only six of the musicians who appeared on Trench Heroes — trumpeters Dave Scott and Rolf Johnson, saxophonists Tod Dickow and Howard Cespedes, trombonists Derek James and Mike Rinta — were present and accounted for when Monday in the City was recorded. What we hoped hadn’t changed was the CJO’s mandate to “promote the modern big–band Jazz tradition by featuring the works of Thad Jones, Frank Foster, Charles Mingus, Dizzy Gillespie, Oliver Nelson, Duke Ellington, Quincy Jones, Gil Evans and other modernists,” and apparently it has not, as there are three compositions by Nelson, two by Thad Jones and one by Ellington on the orchestra’s more recent album (the earlier Trench Heroes opens with Mingus’s “Slop” and includes Nelson’s “Self Help Is Needed” and Foster’s “Disapproachment”). A second part of that mission is to “provide a forum for new composers and arrangers,” which the CJO carries out on Trench Heroes by performing Carroll Coates’ “City Lights” and a pair of compositions by trumpeter Chuck MacKinnon, “Buddy T” and “These Times,” and on Monday in the City by inserting pianist Matt Clark’s clever “Interlude” for solo piano between Kenny Dorham’s “Minor’s Holiday” and Ellington’s “Oclupaca.” I don’t mean to put anyone down but after listening to both albums, the opinion here is that the CJO is a good band under Pitts, an even better one under Budman, which may be a result of natural evolution as much as anything else. Whatever the reason, there’s a dash more muscle and cohesion on Monday in the City than on the earlier album, even though Heroes is quite invigorating and likable on its own terms. The concert at Yoshi’s opens with “Slop,” which, according to John Handy, earned its name when Mingus put two tunes together for a dance date. While the CJO is a long way from sloppy, and alto Eric Crystal frames an inspired solo, Mingus isn’t among our favorite composers, and we’d have led instead with MacKinnon’s boppish Jazz march, “Buddy T,” which follows. MacKinnon is the soloist on “Buddy T,” vocalist Duane Lawrence on “Goin’ to Chicago” and “City Lights,” his burnished baritone reminding one of Kansas City’s Kevin Mahogany. “Disapproachment” is vintage Foster, sharply drawn and straight–ahead, with solos to match by tenor Dickow and trombonist Marty Wehner. To remind the listener that Oliver Nelson wrote more than “Stolen Moments,” the band features Tony Corman’s eloquent alto (and Chuck Bennett’s cavernous bass trombone) on Nelson’s bluesy “Self Help Is Needed” before Crystal returns to blow everyone’s mind on Eddie Nuccilli’s elaborate arrangement of the standard “Body and Soul.” The concert ends with another of MacKinnon’s urbane compositions, “These Times,” which embodies enterprising comments by Crystal, pianist Jacob Semetko, drummer Danny Spencer and the author. The CJO affirms from the outset on Monday in the City that it plans to take no prisoners, storming through Dennis Mackrel’s fiery arrangement of McCoy Tyner’s “Passion Dance” (solos by Clark, tenor Gene Burkert, drummer Andrew Eberhard) before slowing the pace for the first of Nelson’s compositions, “A Penthouse Dawn,” admirably performed by the orchestra and alto soloist Charles McNeal. Burkert, Eberhard and trumpeter Mike Olmos energize the bouncy “Minor’s Holiday,” Clark interposes his enchanting “Interlude” and Budman splices an idiomatic alto solo on “Oclupaca” before the band changes course to stare down Thad Jones’ arduous “Once Around” (ripping solos courtesy of Olmos, Clark and flutist Cespedes) and unwind with Nelson’s smooth and sassy “Miss Fine” (featuring McNeal and trumpeter Steffen Kuehn). Another of Nelson’s picturesque compositions, “Black, Brown and Beautiful,” precedes the fast–moving finale, Thad’s digitally challenging “Fingers,” whose enterprising solos are by trumpeter Dave Scott (muted), trombonist Rinta, tenors Burkert and Dickow and bassist Mike Bacile. The audience at Pearl’s loved the concert, and our guess is that you will too. While Monday in the City is (our opinion) the stronger of the two albums, the advantage is slender, and each of them is strongly recommended.